It's that time of year again... Christmasongs is back! I'm a bit of a freakshow when it comes to Christmas music, so I’m devoting the next couple of weeks to all the holly, jolly, ho-ho-hoing songs of the season. Whether it be tried and true classics, songs that just came out this year, rap, rock, punk, or hymns, we are an equal opportunity Christmas jukebox here. There is a metric ton of good Christmas music out there and only having a month or so to celebrate seems too short! Hopefully the upcoming posts will include some of your favorites, remind you of some good ones you’ve forgotten, and introduce you to some you didn’t know existed. Instead of just posting random musical chunks everyday, I’m going to have them somewhat themed to keep it interesting and to satisfy my aimless organizational needs. As an introduction, I thought I’d start off with some of my personal favorites. This list is by no means a desert island or top ten list (especially since there's eleven tracks), but it’s a good sampling of my own musical melting pot. “Happy Xmas (War Is Over)” – John Lennon: I’ll stop just shy of calling this my favorite Christmas song (because who can really quantify such a definitive label anyway), but you combine John Lennon with Christmas and truthful lyrics that actually say something and you’ve got my undivided attention. Where do you begin with such greatness? The sound; the whimsy of the whispered intro, the moving tone of his unaccompanied voice for the first line, the elevated shift from acoustic sing-a-long to sleigh bells and children’s choir, all sheer perfection. The lyrics; from gripping opener “So this is Christmas and what have you done?” to the simplisticly huge refrain of “War is over if you want it” this song is packed with substance. Every musician takes a shot at covering it and no one comes close to the original. Come to think of it, maybe I shouldn’t stop shy of calling this my favorite Christmas song. “Christmas In Hollis” – Run DMC: If there’s a song that has a fighting chance against John Lennon for my Christmas #1, it’s this one. “Christmas In Hollis” by Run DMC will forever and always be my kick-off to the Christmas season every year. I was seven when the song came out and I remember getting the first A Very Special Christmas cassette and playing/stopping/rewinding this song to learn all the lyrics. Darryl’s verse has always been my favorite due to how smooth his voice and rhythm sound and because “It’s Christmas time in Hollis, Queens, Mom’s cookin’ chicken and collard greens” is as much a classic line to me as “Jingle bells, jingle bells, jingle all the way” is. I’ll never forget the rush of performing it at my 2nd grade Christmas party and instantly transforming from the pudgy, white kid with glasses to the pudgy, white kid with glasses who can rap. I still try to bust it out each year at any opportunity I get because it’s fun to be the pudgy, white adult with glasses who can rap. As a bonus, “Christmas In Hollis” also has a gloriously cheesy music video that would be cool to see on TV this time of year…if only there was a channel that played music videos…. “Labor of Love” – Andrew Peterson: Andrew Peterson is a singer/songwriter based in Nashville that knows how to pack a punch in practically every lyric. Instead of just writing a good Christmas song, he wrote an entire conceptual Christmas album called Behold the Lamb of God that is just stunning from beginning to end. “Labor of Love” tells the story of Jesus’ birth in a manner that’s more in line with what was actually going on at the time. “Away In A Manger” is a beautiful song and all, but the inherent sweetness of it can cloud the reality of a young girl delivering a baby in a barn full of animals on a cold night with only Joseph there to help her. The fact that Jesus’ birth was instrumental in Him living as entirely human and entirely God is a cornerstone of the Christian faith and “Labor of Love” really helps you understand what that birth entailed. This song is raw and gorgeous and destroys me every time I hear it. "Labor Of Love" is beautifully sung by fellow Nashville singer/songwriter Jill Phillips. “What Can You Get A Wookiee For Christmas (When He Already Owns A Comb? 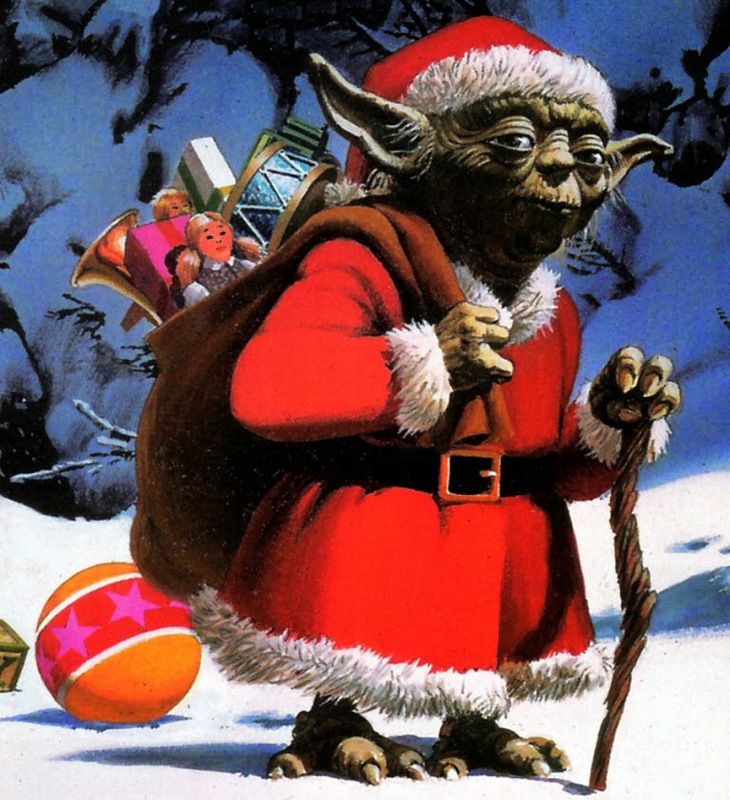 )” – Meco: Yes Virginia, there is a Star Wars Christmas album and it is as glorious as it sounds. Christmas In The Stars: Star Wars Christmas Album was released in 1980 and features C-3PO, R2-D2, Chewbacca and a host of other characters ringing in the intergalactic holidays as only they can. Like all kid’s programs in the 80’s, there are lessons to be learned and they aren’t afraid to ask the hard questions like “What Can You Get A Wookiee For Christmas (When He Already Owns A Comb? )” While the song gives a few options, the perfect gift they decide on isn’t revealed until later in the album on the song “Merry, Merry Christmas.” You don’t get that kind of plot development and story resolution from just any old space-based holiday album. Christmas In The Stars is a treasure for sure and it should be added to everyone’s collection. "Christmas Day" - MxPx: Along with other cool bands like R.E.M. and Pearl Jam, MxPx has recorded a bunch of Christmas singles over the years and has released them through their fan club. “Christmas Day” was released for Christmas of 1998 and it’s still one of my favorites out of their batch of holiday releases. It’s got a great punk vibe and is easy to sing a long with at the top of your lungs. I recommend listening to it while decorating the house or driving around during the dark winter nights. In fact, it could make any experience better this time of year, so just keep it cued up. “Christmas Day” can also be found on Tooth and Nail Records’ Happy Christmas, Volume 2 and MxPx’s Punk Rawk Christmas. “Christmas Wrapping” – The Waitresses: I know, I know…people either love the 80’s New Wavey awesomeness of this song or they hate that it’s played so much. I am absolutely in the former camp because this song is really, really good and it’s possibly the only Christmas song to reference one time grocery giant A&P. The song is super festive and relays a bunch of missed connections that tie together nicely in the end. I love the sound of this song and the late Patty Donahue had one of the coolest and most distinctive voices in the New Wave genre. Special thanks to Steve Craig, radio DJ hero of my teens, for cementing this song in my holiday heart by spinning it a few times every year during his "House Of Retro Pleasure" Christmas shows. I can't thank that guy enough for all the great music over the years! “The Christmas Song” – The Raveonettes: One of my favorite Christmas compilations is the Maybe This Christmas series from Nettwerk Records. Although they’ve sadly only released three of them, each one is packed with great tracks, including “The Christmas Song” by The Raveonettes from the third one. Man, when I first heard this song it instantly became my go-to Christmas date night song. Something about the way Sune and Sharin’s voices blend together with the mellow bounce of the guitars make this track audible mistletoe. If you could actually describe a song as “cozy,” this would be the one. It’s physically impossible to listen to this song without getting closer. So if you find yourself alone in Wal-Mart and this song starts playing, you’ve been warned. “Oi To The World” – The Vandals: While No Doubt had some mainstream success with their cover of “Oi To The World” via A Very Merry Christmas 3, the song was originally recorded by Huntington Beach punk band The Vandals. I really like both versions, but there’s a certain charm to The Vandals’ raw and reckless approach. The song addresses racial tensions and the eventual mutual respect that can be found. “Oi To The World” is really awesome and the question of “Where’s the Oi I gave to the world” sadly still seems pretty relevant. “Must Be Santa” – Bob Dylan: This song is from the 60’s but Bob Dylan based his 2009 cover on a version by “polka plus” band Brave Combo. Rowdy, fun and totally overflowing with yuletide frothiness, “Must Be Santa” is perfect for oom-pahing around the Christmas tree. The video is really fun to watch too as it depicts a packed out Christmas party that delves into some unruly shenanigans. Bob wouldn’t be Bob if he didn’t mess with the song a little bit and he Dylanizes “Must Be Santa” by replacing the reindeer names with President’s names. In regards to the effect Bob has had on the political landscape of the last 40 or 50 years, he can get away with it. “Must Be Santa” is an instant party, just try not to spill your eggnog all over the place. “Come On Ring Those Bells” – Phantasmic: I’m a junkie for the plethora of 90’s Christian alternative bands that came and went with only a release or two under their belt. Many of them played a huge role in my middle school and high school years. Tess Wiley spent some time in Sixpence None The Richer in the mid-90’s, but eventually left to pursue some solo projects. She fronted Phantasmic for a short period of time and the lo-fi outfit contributed a wonderfully unpolished cover of Evie’s “Come On Ring Those Bells” for Christmas In Heaven. The relaxed, folky romp sounds like it was loosely recorded in someone’s living room during a Christmas party. As a kid, I was exposed to the original song for years, including a yearly production at a local church that involved the choir disguised as a human Christmas tree with only hand bells and faces exposed. Although that image is still simultaneously hilarious and haunting, I seriously can’t get enough of this version. “Why Can't It Be Christmastime All Year” – Rosie Thomas: If you find yourself in need of an instant jolt of festive Christmas spirit, look no further. I first heard this song on a Paste Magazine sampler and when I popped the cd in, I’m pretty sure it caused eggnog to flow out of my speakers and mistletoe to grow from my rear view mirror. It’s a really fun song and the party vibe is driven home by all of the energetic instrumentation and the background voices. “Christmas Is My Favorite Time Of Year” can be found on Rosie’s 2008 album, A Very Rosie Christmas.